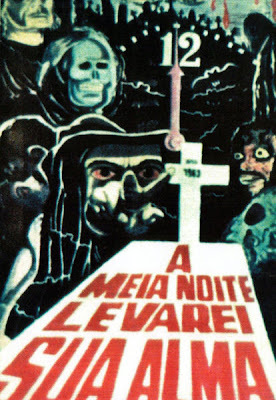 At Midnight I’ll Take Your Soul was the first Brazilian horror film. Not a bad introduction for the Brazilian horror genre. Coffin Joe( or Zé do Caixão) is a man not to be reckoned with. Those that negatively cross his both end up dead in seconds. Coffin Joe’s bloodshot eyes foreshadow the deaths that he is responsible for. 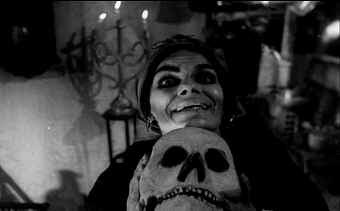 Coffin Joe makes Bela Lugosi look like a thieving gypsy. Mario Bava was obviously a huge influence on At Midnight I’ll Take Your Soul. Bava’s Black Sunday would go great with a double feature screening of At Midnight I’ll Take Your Soul. Both films feature great early 1960s special effects and cheese evil. At Midnight I’ll Take Your Soul is quite extreme for it’s time(as was Black Sunday). Coffin Joe has no problem blinding someone with his bare hands(with a bloody mess as a result). Bava had no problem letting the blood flow freely with Black Sunday. Coffin Joe opens At Midnight I’ll Take Your Soul with an intense and philosophical speech about blood. He does so with an intense and serious face. This give me immediate respect for Coffin Joe. Any killer that demands respect like Coffin Joe is true dark gentlemen. Leatherface makes introductions with his arms sprawled out in the air making noises like he was raped at a biker’s bar. Jason Vorhees walks around in a retarded stupor. Coffin Joe is a man’s man. Badass Coffin Joe also puts all Western lone men to shame. He is able to battle a whole town single handedly. He has more confidence and charisma than John Wayne does on his best day(even in The Searchers). Coffin Joe also has more style with his complimenting and appropriate wardrobe. He looks like a mortician from a century ago. 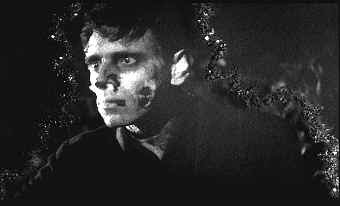 The end of At Midnight I’ll Take Your Soul features some of the best and corniest vintage horror special effects. I wasn’t too thrilled about seeing Coffin Joe in fear but something scares everyman. Joe’s eyes change a lot from the beginning of the film to its climatic ending. You have been warned!